Rural crime fell in Cumbria after a police initiative encouraged farmers to mark their property so it could be more easily recovered when stolen. Following foot and mouth, crimes against the farming community rose. Farm Watch membership was low, there was poor interaction between the police and farming community and a reluctance of farmers to spend money of security products. The Farm Watch scheme improved engagement with the farming community after an increase in rural crime following the 2001 foot-and-mouth crisis. Compensation payments to farmers following foot-and-mouth had seen the purchase of new agricultural equipment – and criminals had identified an opportunity to exploit the situation. Quad bike theft alone tripled in the three years following the outbreak – with the total value of vehicles stolen exceeding £1m during that period. Analysis had identified low engagement and poor interaction between the police and rural community with fewer than 200 Farm Watch members. Funding was secured for free property marking products as an incentive which encouraged more farmers to become Farm Watch members. The recruitment drive increased Farm Watch membership and resulted in a subsequent reduction in crime – but subsequent funding cuts threatened continued development. In times when government funding was more plentiful, Community Safety Partnerships had provided free DNA solution-based property marking kits. When funding run out some farmers remained reluctant to purchase their own security products – even though criminals are known to target premises not displaying Farm Watch signage. Cumbria Neighbourhood Watch Association helped to address the funding issue and change the “something for nothing” culture by supplying security products at a discounted rate. Farmers were provided with property marking kits at a discount provided they registered on the police communication system in return. Farmers proved more willing to purchase equipment from the association because they viewed doing so as supporting a charity and Farm Watch membership now exceeds 2000. The objective of registering on the system was to maintain contact with farmers – enabling police to provide regular reports and security advice reminders. Products were backed up with signage and a campaign among known criminals targeting rural premises promoted the risks of being caught with identifiable property. Crimes fell against farmers who displayed property marking stickers on marked equipment and displayed the signage at access points to their farms. At the same time, intelligence from the rural community increased because of the higher level of interaction between police and farmers. The communication system was a CSP initiative and successfully addressed the crime problem. But it also opened up a wider channels of communication with the rural community, enabling other issues to be successfully addressed too. It enabled Trading Standards to address farmers about issues around livestock movements and it made it easier for Fire and Rescue to highlight fire risks. Initially, recipients were just handed security products and left to get on with it. Today, provision to the farming community is supported by face-to-face advice on wider aspects of security. Police staff visit premises and Farm Watch members continue to be regularly reminded about the importance of replacing lost or broken signs to deter criminals. Poor interaction between the police and farming community. Reluctance of farmers to spend money of security products, fuelled by willingness of Community Safety Partnerships (CSPs) to provide free products during a period of time when government funding was plentiful. Compensation payments following the Foot and Mouth breakout provided farmers with opportunities to purchase new equipment. Criminals identified the opportunity to exploit the situation. Quad bike theft alone tripled in the three years following the outbreak, with the total value of vehicles stole exceeding £1 million during that period. CSP funding was utilised to procure property marking kits (a DNA solution based product). This was provided free to farmers provided they register on the police communication system. The property marking product was backed up by signage and a ‘marketing campaign’ amongst known criminals targeting such premises – promoting the risks of being caught with identifiable property. The objective of registering on the communication system was to maintain contact, providing regular crime reports and security advice reminders. The communication system was a CSP initiative – engaging the wider partnership in addressing the crime problem, but opening up channels of communication with this community to address partnership issues (Trading Standards – animal movements; Fire and Rescue – fire risks; etc.). Crimes against farmers within the scheme (who displayed signage at access points, and property marking stickers on marked equipment) fell, and intelligence from that community increased according to the level of interaction through the messaging system with the local NPT. When stock and funding ran out, there was no succession planning – for either security products or the communication system. There was also evidence that signage deteriorated and wasn’t replaced, leading to victimisation – criminals are known to target premises not displaying Farm Watch signage. 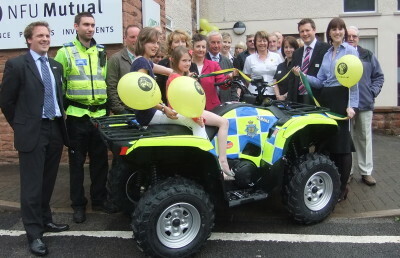 Cumbria Neighbourhood Watch Association procures security products and sells them on to farmers at discounted prices. Being a charitable organisation, this makes it palatable for farmers overcoming cultural reluctance to invest in security. The Association is also the licence holder for the communication system, attracting wide ranging partners improving sustainability. Farm Watch members are reminded regularly to replace lost or broken signs. A piece of hardboard added to the rear increases the lifespan significantly! Provision of security products MUST be supported by face to face advice on wider security aspects. Initially recipients were just handed the product and left to it. Now, police staff visit the premises and conduct a risk assessment providing wide ranging advice.